3D Touch, the new iPhone 6s feature, has undoubtedly become the star of the show for iPhone users. People love it simply because it makes navigation on their device easier and faster than before. With this technological update, iPhone 6s lets users know that it’s sensing the pressure applied to the screen. 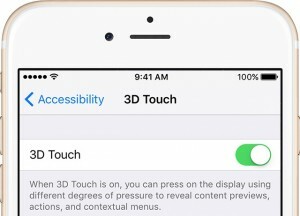 3D Touch is essentially a system devised to detect how hard you press on the screen and it’s very easy to use, but there is an advanced technology behind it. This recently added feature is time-saving as it allows users to press any app and perform actions without entering the app in question. Moreover, it lets them preview content or jump right into it with the novel Peek and Pop gesture, by applying varying degrees of pressure to the screen. Open Settings app on your iPhone 6s. Navigate to General and tap on it. Toggle the 3D Touch switch to the ON position to enable the feature. Now you know how to turn on 3D Touch on iPhone 6s. And it’s as simple as that! Your device should now respond to how hard or light your finger is pressing the screen. 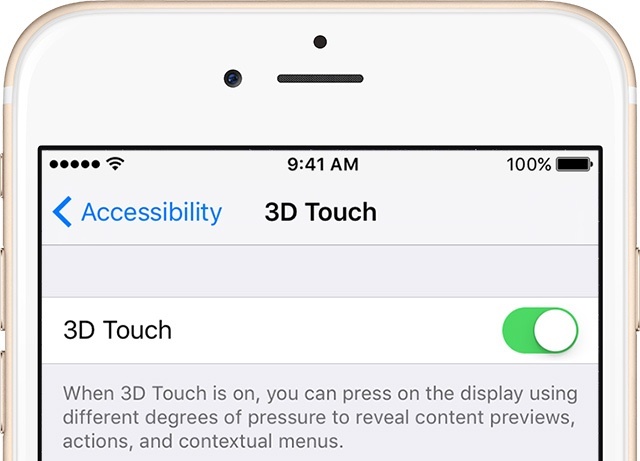 If you wish to disable the feature, you can toggle the 3D Touch switch to OFF and it’s done. Find out more about the incredible 3D Touch addition here. If you thought the information was helpful, check out other such guides on our blog to improve your iPhone experience.